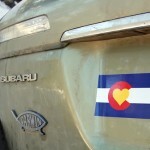 Colorado Love Archives - It's New and Different! It's New and Different! The stickers are finally here! My Subaru is very, very happy. Do you love Colorado, too? Get your very own over at Colorado Love.